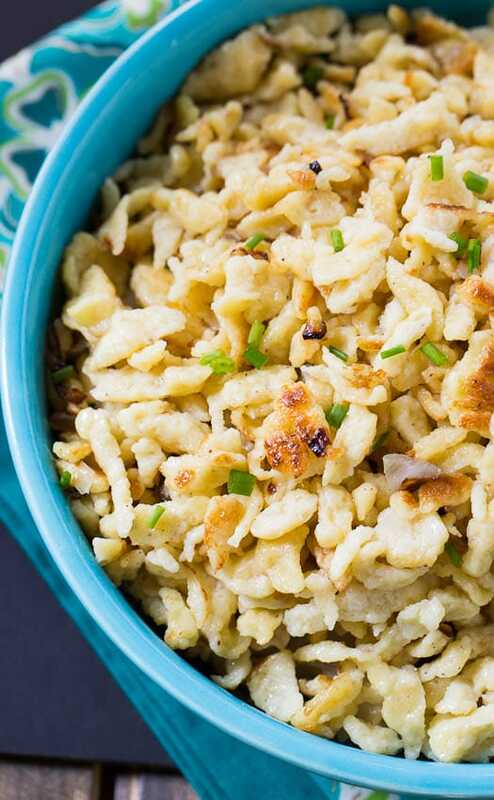 Homemade Spaetzle is kind of like a cross between egg noodles and southern dumplings and it is a delicious side dish to add to a German-inspired meal or quite frankly, any meal. Talk about inexpensive comfort food! This is a recipe from Cook’s Country, a recipe source I turn to time and time again when trying something new. This was the very first time I had tried making spaetzle and thanks to the Cook’s Country recipe, I was very happy with the results. It was actually super easy to make and I think it is something I will make time and time again as I always have the ingredients on hand. 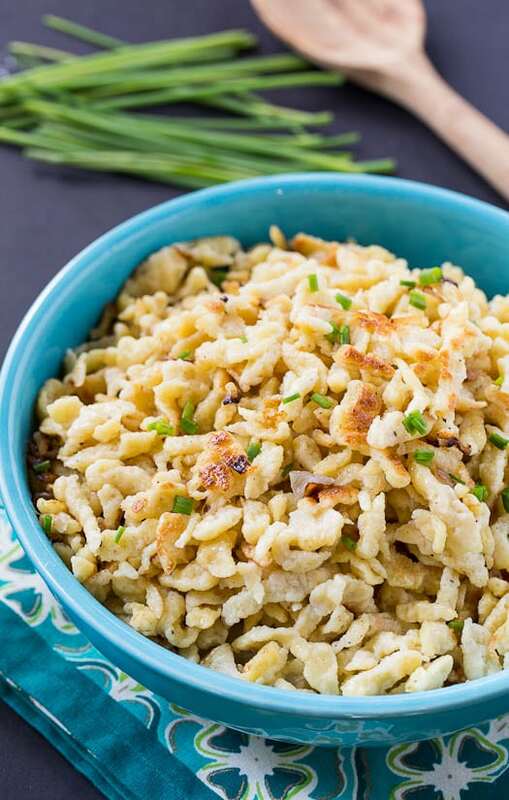 Spaetzle is made from an easy batter of flour, eggs, and milk and usually a little nutmeg which gives it an awesome flavor. A spaetzle press is used to shape the dough directly into boiling water. Some recipes call for putting it in an ice bath next, but this recipe does not. To finish the spaetzle, it is cooked in a little vegetable oil/and or butter until golden and crisp, usually with a little shallot or onion. This recipe adds some butter at the end so you don’t have to worry about burning it. If you don’t have a spaetzle press, Cook’s Country suggests using a disposable aluminum pan (like the kind you would cook lasagna in) and punching 1/4-inch holes in it. You can also use a colander if the holes are big enough. If you think it is something you might make frequently, a Spaetzle Maker is probably a good idea. They are relatively inexpensive, as low as $6.99. While the aluminum pan works pretty well, it is a little time consuming to punch the holes and get them just right. Mine probably ended up being a touch too small. Plus you are left with many sharp, pointy edges on the bottom of the pan which make trying to clean and reuse the pan a little hazardous. 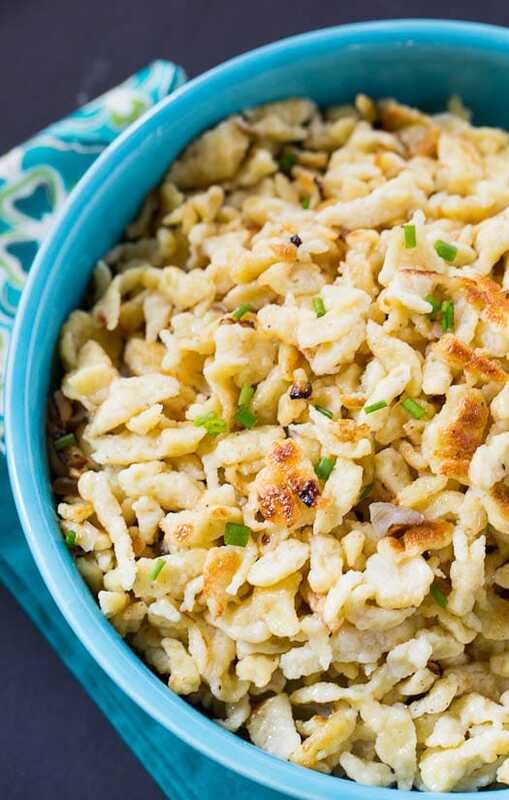 Fry up some schnitzel or bratwurst to go with this buttery spaetzle and maybe some sweet and sour cabbage and you have yourself a delicious German-themed meal. 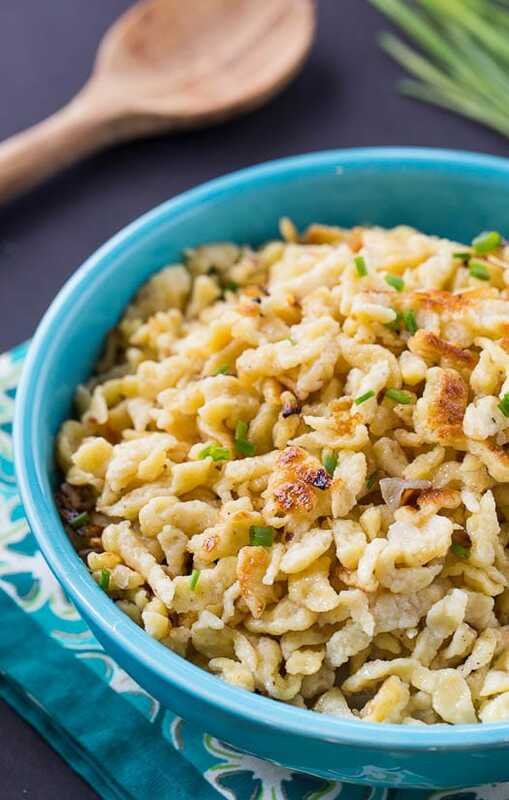 Delicious homemade spaetzle makes a great side dish to pair with any German food. In a large bowl, combine flour, salt, pepper, and nutmeg. Whisk eggs and milk together in a medium bowl. Gradually whisk milk mixture into flour, whisking until smooth. Let sit for 15 to 30 minutes. Poke about 40 1/4-inch holes in the aluminum pan using a paring knife. Use a rubber spatula to press the batter back and forth across the holes. Set pan aside. Boil until spaetzle float, about 1 minute. Remove them with a slotted spoon and place on a paper towel-lined plate. Repeat with remaining batter. Heat the oil in a large nonstick skillet. Add shallot and cook for 1 minute. Add spaetzle and cook for 5 to 7 minutes, stirring occasionally. Remove from heat and stir in butter. Check for seasoning and add more salt and pepper if desired. This entry was posted in Side Dishes and tagged German, side dish. Bookmark the permalink. I do have a spaetzle maker and we love it as a side dish (I like butter and parmesan on mine) or added to some long-simmered green beans with bacon. I like to make it in very large batches and then dehydrate it so I have “instant” spaetzle store in vacuum-sealed jars on the pantry shelf. It’s so handy to use as a nice homemade side dish on those nights when you’re wishing for something a little different to have! I just got back from Germany and LOVED spaetzle. I especially loved the cheesy spaetzle. Can’t wait to try this! I love Cooks Country too! One of my go-to cooking magazines. 🙂 Lame I know, but I’ve never had spaetzle in my life before! Can you believe it?! I am totally gonna have to give this one a go—looks amazing, Christin! 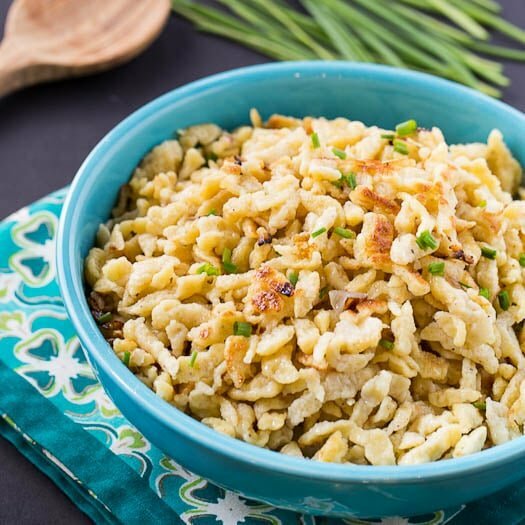 Spaetzle is pretty much my favorite side dish ever! And definitely underappreciated.This looks awesome! I love German foods including Spaetzle! I just post German finger dumplings the other day – another one of my favorites. We have my husband’s Grandma’s Spaetzle maker in the basement and I really need to dig it out! These look delicious. I’ve never tried spaetzle before, but you’ve definitely convinced me after this. It looks delicious! 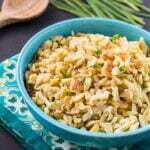 I’ve never had spaetzle, but it sounds just delicious! I love Cooks Country. Their recipes work, every single time. They’re the best. This spaetzle looks delicious, Christin! I haven’t had it in years, but my Grandma used to make this when I was younger. Sounds like this would be a perfect side dish to make!